Siena College released a poll of New York voters this morning, just as Westchester County Executive Rob Astorino is warming up his very underdog campaign against popular Governor Andrew Cuomo. 1. 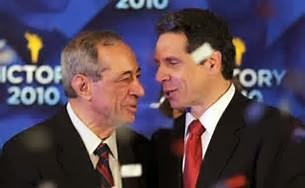 Ghost of Mario– Andrew Cuomo has fully exorcised the ghost of Mario and shaken the political baggage with moderate voters that could come from being the son of one of the country’s mosteloquent liberal voices. 61% of all New York voters call Cuomo a moderate or conservative. But avoiding the caricature of a big government progressive carries a price with some elements of the Democratic base- 13% of Democrats call Andrew Cuomo a conservative, including 24% of African-American voters. But a primary from the left against Cuomo is a fool’s errand, Astorino is taking hard right positions on social issues and left-of-center voters will stick with the pro-choice, pro-gun control incumbent. Cuomo has deftly kept himself popular and in the center, maximizing his leverage with Democratic interest groups in Albany while remaining a palatable moderate with whom Republican voters permit their senators to do business. 2. Nobama– But Cuomo’s relationship with moderate and conservative voters could go south quickly if he bear hugs President Obama. 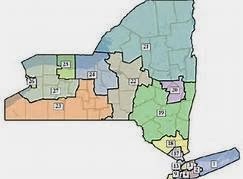 Obama is a massive political liability upstate, where voters disapprove of him by a 58% to 39% margin. Even in the suburbs- which Obama won handily in 2012– voters are evenly divided on the President’s performance, with 48% rating Obama unfavorably compared with 47% viewing him favorably. Expect Astorino and NY Senate Republicans to try to nationalize their campaigns with messages blasting Obamacare, while Cuomo and state Democrats try to keep the conversation about New York. Cuomo, by virtue of being a governor, will win this argument, but it spells trouble for Democrats running for Congress (see #3). 3.House of Bad Cards– Democrats need to hold congressional seats like the one Rep. Sean Patrick Maloney wrested from Hudson Valley Republican Nan Hayworthin 2012. This poll is not only a clear warning sign for Maloney, but also shows obstacles for Sean Eldridge‘s attempt to knock of GOP Rep. Chris Gibson and should cause pause by Congresswoman Nita Lowey. The bloom is off the Obama rose in the Hudson Valley. Maloney needs to distance himself from the President to get re-elected while raising records amount of cash from uber-liberal donors. Expect Hayworth to plaster the northern portions of this district with pictures of Maloney and the President. 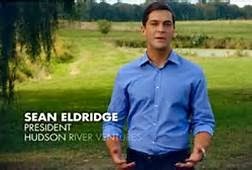 Eldridge, whose Facebook-founder husband Chris Hughes ran Obama’s digital campaign in 2008, faces an uphill battle to knock off Rep. Chris Gibson, who has styled himself as moderate in the radical GOP house and tended to the local concerns of his sprawling 11-county district. Eldridge’s bio makes no mention of his partisan leanings and refers to him as an “independent.” Lowey is facing an ideologically charged challenge from Chris Day, an Army vet whose father was just elected the Rockland County Executive. Day, like Hayworth and Gibson, will also attempt to link his Democratic opponent to the damaged-Obama brand. He’ll add a harsh critique of the President’s Israel policy that can resonate with this district’s hawkishly pro-Israel voters. Lowey is well-liked and favored to win, but she needs to gird for battle. Her campaign website hasn’t been updated since August 2013. 4. Maybe I Inhaled too Deeply– Last week, I looked at a Quinnipiac College poll that showed NY Democrats favoring legal marijuana by a 65 to 31 margin andpredicted legalization by 2016. Today’s poll shows Democrats opposed 49 to 46. I think that is mostly because of the way the questions were worded: last week’s poll referred to legalizing “small amounts” of weed and generated wide support while today’s poll put no limit on the quantity and revealed markedly less enthusiasm. While Siena shows independent voters favoring legal weed by 10 points, the mixed data demonstrates why Cuomo and other state leaders are reluctant to enter the haze on the issue. Maybe Hillary doesn’t need to light a pipe after all. 5. Downballot Democratic Blues– Eric Schneiderman has landed multiple front-pages as New York’s attorney general, leading the national conversation on foreclosure settlements and presiding over high-profile drug busts. Nonetheless, he remains a total unknown to many voters, including 63% of voters in the politically crucial suburbs. Both Schneiderman and Comptroller Tom Dinapoli, the other statewide official seeking re-election this year, received favorable ratings only in the high-20s. The New York Times recently profiled Schneiderman’s clash with Cuomoand DiNapoli and the governor have tangled as well. But neither official appears able to stand on their own as a statewide candidate in a year with ear-ringing political noise and both will swallow their pride and hoist hands with Cuomo to smooth their way to victory.